It has been very quiet in this blog series. There’s only one reason: deployment was a more than fulltime occupation. Time for writing was never more scarce. Today the big rush is over and I can find some time to reflect on the past few weeks. 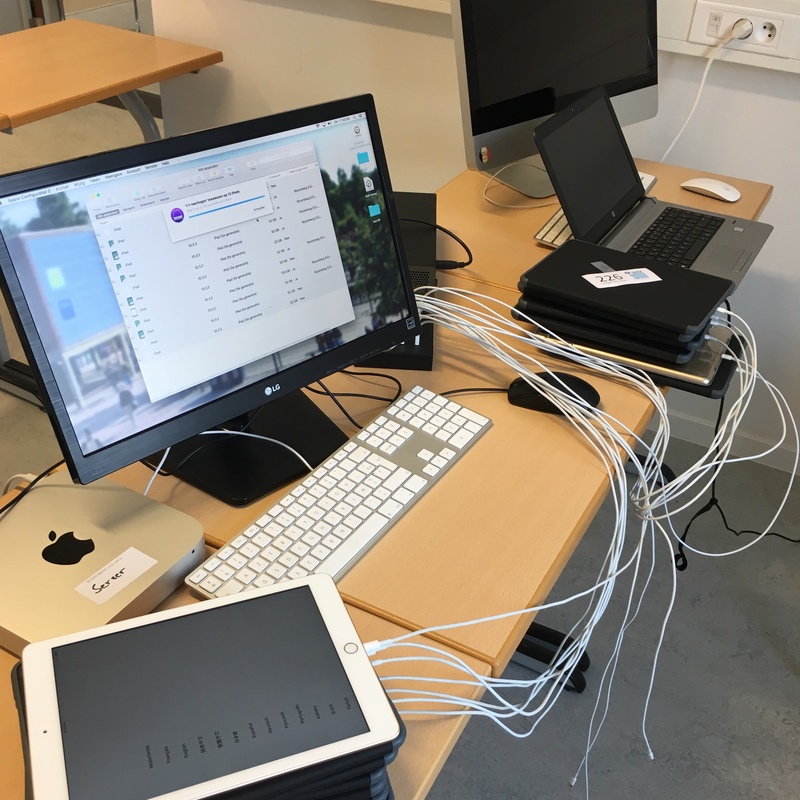 As I mentioned in the previous post, students and their parents had to chose one of three scenarios: either they already own an iPad and let us supervise that device, either they buy one through a webshop from our partner or they lease a device from school. They also have the option to opt-in to our school insurance (with the exception of pre-existing devices). To gather all this information, I made a Google form. First big lesson: make sure people get an email with the content they filled in the form after they submit it. Second big lesson: set a clear deadline and remind people of that. After all new students were enrolled in the school (all of our first graders are obviously new students), people made their choice and all had to make an appointment for our roll-out days. We made 1 hour time slots to chose from. We decided to organize the roll-out on two consecutive days right before the start of the new school year. Reminder: look back at the two big lessons from before. We scheduled the roll-out at the end of August, two and three days before the school yea starts. This is a time most students are back from holiday and we have had some time o prepare. July 30th, I assembled a list of all students that wanted to buy an iPad through the webshop of our Apple Solutions Expert. They sent e-mails with login information to the students. As soon as all students were up to date in our Student Information System (SIS), I could create users in all necessary platforms: our MDM, our electronic learning environment (ELO), Office 365 and G Suite. Our MDM and ELO use a csv-import, the rest has a connection with our SIS through an Active Directory. The MDM connects to Apple School Manager to create classes and managed Apple IDs. You can plan all you want but in the end you will not have thought about everything. The morning of the first day, the lease device were delivered to the school and we could setup the roll-out. We had help from 8 colleagues to prepare all 550 envelopes and help with the roll-out. This “workforce” was invaluable. Parents and students would arrive at their scheduled times an be given their envelope. Missing envelopes could be created on the spot. The attendants would go in another room filled with tables and open their envelopes. They would read and sign the agreement and go through the checklist (if applicable). In this stage the students who had chosen to lease a school device would hand in the lease agreement an receive their device together with a case. They also take home the box (it contains the cable and charger). Every student moves on to a next room. This room serves as a waiting room for the ones that handed in their iPad and a setup room for everyone. Everyone in this room gets a run-through on paper for configuring their iPad. Lease devices are in the Device Enrollment Program and are automatically enrolled in our MDM. Other devices are enrolled through Apple Configurator. What did we learn (the hard way)? Managed Apple IDs are not what you want to use on an occasion like this: too many students had to come an ask a teacher for a verification code. The teachers could give these, but this is very inconvenient when you are in a busy classroom with 40 other people configuring their iPad. And last: you can plan all you want, you will forget stuff, either small or big. Just stay cool and do what it takes to get your job done.